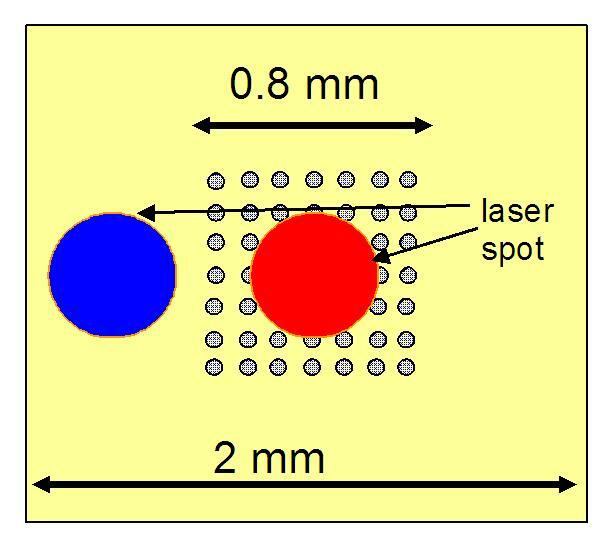 Figure 5.10: Experimental geometry to measure Kerr signal in Fe antidot film in the external region and in the antidots region. The same Fe antidots film was magnetically characterized at room temperature by F. Cebollada and F. Pigazo in the EUIT Telecomunicacion UPM using a magnetooptic Kerr effect device. The examined sample had diameter and interantidot distance . The Kerr device is adapted to measure the angular dependence of the hysteresis loops and also the transverse initial susceptibility (TS). This technique yields the effective anisotropy field of a sample and consists of generating small amplitude magnetization oscillations in a saturated sample by simultaneously applying a large (saturating) DC field -along either the e.a. or the h.a.- and a small AC field , perpendicular to [Hoffmann 64]. The laser beam was collimated to . Due to the size of lithographed area, this allows to measure independently the demagnetization loops in the external Fe film and in the antidots region (see Fig. 5.10). Figure 5.11: Hysteresis loops measured in the continuous film and antidots regions along the (a) easy and (b) hard axes. Measured in the EUITT UPM by F. Pigazo and F. Cebollada. Fig. 5.11 shows the hysteresis loops corresponding to the antidots region and to the continuous film measured in the film plane along the e.a (a) and the hardest in-plane axis (b) of the sample. The measured coercivity is congruent with the result obtained by J.M. Torres using AGFM, including the different values for the external and the antidots region. The TS measurements obtained in the array region along both the e.a. and in-plane h.a. (inset in Fig. 5.12) yielded an anisotropy field close to that, by considering the bulk Fe magnetization value, corresponds to a first order anisotropy constant value , very similar to the corresponding bulk Fe magnetocrystalline anisotropy constant. The TS results confirm that the patterning process preserves the original four-fold symmetry but do not show any increase of the anisotropy constant with respect to that of the bulk Fe. This can be related to the fact that the magnetization oscillations induced during the TS measurements do not result in significant variations of the dipolar energy of the moment structures at the antidots surfaces. As for the angular dependence of the reversal process, the loops measured in the antidot region with the field applied along a direction at an angle with respect to the Fe e.a. (Fig. 5.12 shows the loops measured at ; and ; ) present two irreversible jumps at fields and , with the only exceptions of those measured along the e.a. ( ) and the in-plane h.a. ( ), which present a single jump. Therefore, for these angles the total film magnetization presents three jumps: two corresponding to the antidot region and the other one to the non-lithographed film. Fig. 5.13 shows the evolution of and with : while slowly decreases, increases sharply with the increase of . Figure: Hysteresis loops measured in the antidots region with the field applied at different angles with respect to the e.a. The inset shows the transverse susceptibility dependence on the saturating field value . Measured in the EUITT UPM by F. Pigazo and F. Cebollada. Figure: Experimental angular dependence of the switching fields of the array, normalized to . Measured in the EUITT UPM by F. Pigazo and F. Cebollada.